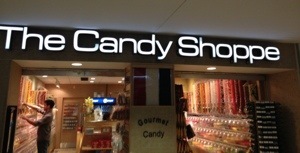 Nothing takes the edge off of air travel like candy (well, alcohol helps, too). This week on my travels, I was craving some Swedish Fish (just red, please), and what to my wondering eyes should appear, but a candy store on concourse B in Denver. They had an amazing array of candy by the pound. Sure, it was a little more expensive than the local grocery store, but it was sooo worth the price. Look for this stress-relieving emporium near gate B-27. Posted in chewy candy, travels and tagged swedish fish. Bookmark the permalink. I’ve been there 🙂 don’t remember buying anything, but fun store. lol the alcohol–do you like the chocolates with the boozy centers? Yes, someone gave those to me for Christmas and they were good!